My husband loves any dish that has pork and kimchee, whether it’s a stew, soup or sauté. 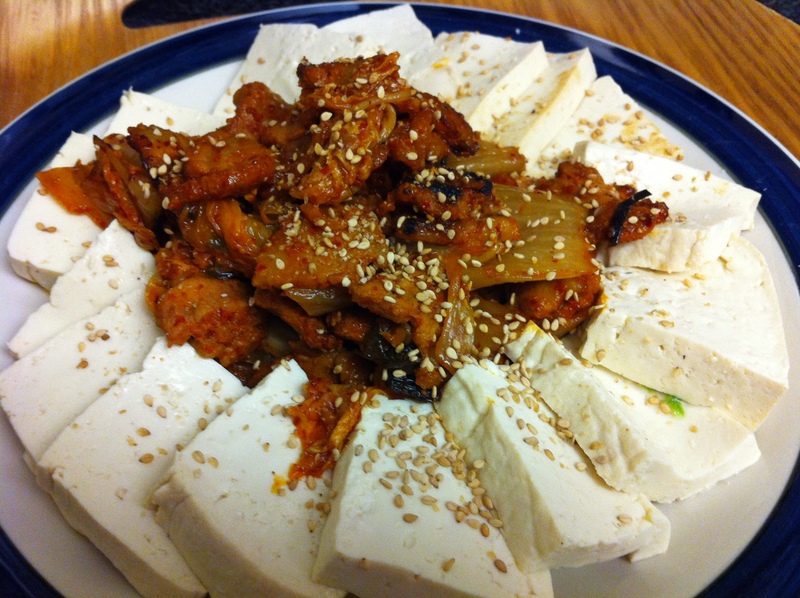 As such, one of his favorite dishes is dubu Kimchee, which is a spicy pork and kimchee sauté served with tofu. I usually fry the tofu on a skillet but today, I decided to boil it instead to cut the calories. The easiest way to make this dish is by using same marinade as osam-bulgogi that I call “Spincy Korean BBQ Marinade,” which was introduced a few weeks ago. As I mentioned earlier, I simply make a lot of this at once and store it in the refrigerator, which lasts weeks. You can use it on pork, squid or a combination of both. Letting the sauce sit in the refrigerator actually makes it taste better over time. If you do not already have this marinade on hand, you can make a slightly different version of it by simply omitting gochjang (고추장, red pepper paste) and keeping the ratio of gogugaru (고추가루, red pepper powder) and soy sauce the same. Mix all the ingredients for the marinade. If you do not have rice syrup or anything similar to it, you can replace it with another tablespoon of sugar or agave syrup. Set aside a few tablespoons of the marinade and combine it with the pork and vegetables except for the scallions. The marinade should lightly coat all the pork and vegetables but not soak it. Let it sit in the refrigerator for at least 30 minutes. While the pork is marinating, add a pinch of salt to the water and bring it to a boil. Add the tofu into the boiling water and cook it for about 10 minutes. This prevents the tofu from falling apart when you cut it. Drain the tofu. Cut the tofu into half then divide them into another 8 pieces. Repeat on the other half so you have a total of 16 pieces. Drizzle the sesame oil into a skillet on high heat and sauté the marinated pork. Add the kimchee when the pork is almost fully cooked and sauté. Taste and add the sauce you set aside if needed. When the kimchee is soft, add the scallions and cook for another 2-3 minutes. Take off the heat and drizzle 1 tablespoon of sesame oil and mix. 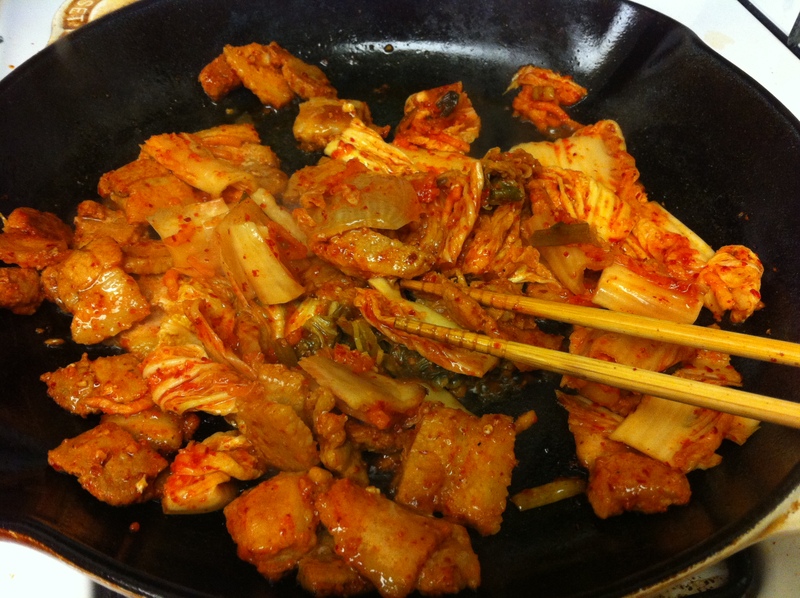 Place the sautéed pork and kimchee in the center of a large plate then circle the tofu slices around in a circle. Sprinkle toasted sesame seeds for garnish. This entry was posted in Good for dinner, Good for lunch, Main Dish, Meat/Chicken and tagged Dubu, Kimchee, Pork Belly, Samgyupsal, Spicy Korean BBQ Marinade, Tofu by gangnamkitchen. Bookmark the permalink. Hi V! Loved this recipe, it was so delish and easy to make! Thank you for all of your wonderful, delicious recipes! Cooking is so fun and easy because of you!